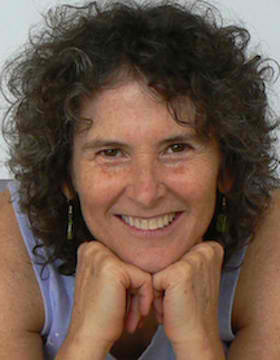 Joanne Rocky Delaplaine discovered Iyengar yoga in the mid-1980s while trying to cure her chronic lower back pain. She began her studies with yoga teacher and physical therapist Stan Andrzejewski (and experienced pain relief in her first class) at Unity Woods Yoga Center. Rocky eventually became an apprentice to Unity Woods’ director and senior Iyengar teacher, John Schumacher, and studied with Carol Cavanaugh, former director of the Iyengar Yoga Institute of San Francisco. In 1990, Rocky trained at the Iyengar Yoga Institute of San Francisco, where she was introduced to yoga for scoliosis in a workshop led by Elise Browning Miller. That same year, she met yoga master B.K.S. Iyengar, who adjusted her spine during a public program honoring him. Rocky returned to the Washington, D.C, region in 1991 and began teaching at Unity Woods. In addition to general classes, Rocky has taught gentle and back-care classes for many years. She continued her studies in yoga for scoliosis with Elise and was certified to teach yoga for scoliosis by Elise in 2014. Rocky has also been influenced by the work of Iyengar-trained medical doctor Mary Pulig Schatz, (author of Back Care Basics). Rocky has been to India twice to study with the Iyengars, and took part in the women’s intensive in 1997. In addition to teaching group classes, Rocky works privately with students of all ages who have scoliosis and/or a range of other back issues – including herniated discs, sacroiliac pain and sciatica, neck and shoulder pain, spondylolisthesis and spondylolysis. Her back care class, workshops, and general classes have helped students with osteoporosis, arthritis, temporary conditions such as menstruation, P.M.S., pregnancy, menopause, and workplace conditions that require heavy lifting or other aggravated load-bearing on joints. In 2013 she joined the faculty of the Casey Health Institute in Gaithersburg, Maryland, which integrates conventional Western medicine with alternative modalities, including yoga. Rocky enjoys working with students who have special needs or injuries, and with older students who may initially feel stiff, or may be afraid to try yoga. She is able to create a safe and relaxing environment where individuals can work at their natural pace to stretch, strengthen, create traction, improve balance, de-stress, breathe, and have fun exploring the vast art and science of yoga.